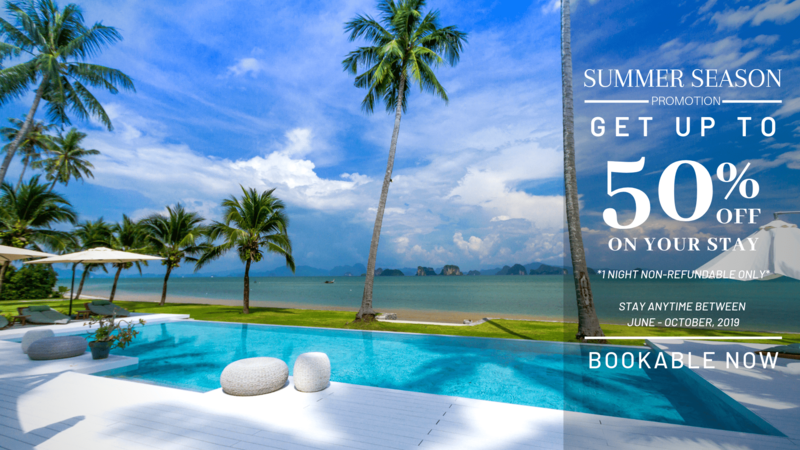 Looking to head to Thailand during the summer season? Why not stay in a Full-Service luxury villa this year. Beat the usual crowds, and get even more privacy than is usually obtainable on the island, with your own secluded villa, right on the beach. "Stay anytime between June - October 2019 at Coastal Escape Koh Yao Noi*"
Breakfast included (generous spread - more than 60 items to choose from). 20% off all food and beverage purchases during your stay. 20% off all SPA treatments during your stay. Free hire of mountain bikes, SUP paddle boards, sea kayaks and Hobie 16 sailing boat. Free wifi internet and Premium movie and sports channels. A payment/deposit with us won’t be lost. The deposit is non-refundable but not lost. If there is a cancellation for whatever reason the deposit can be used against any re-booking (same travelers) within 1 year from the intended check-in. Full restaurant and bar services, on demand, in your villa or main pool restaurant. Taxes and service included in the rates. Full payment for no show. All discounts and inclusions...ONLY if booking via our own website!